I have not been on all the trails yet this season, but will report on ones I have been. The PCT is in good condition; the Granite Chief Trail is in good condition; Five Lakes Creek Trail is in decent condition, some down trees but nothing that can’t be bypassed; the Powderhorn Trail is becoming quite brushy and though I did some work here, there are many days left to do, and there is a tangle of down trees about 2/3 of the way from the top that could not be bypassed by horses due to the terrain; Western States Trail is in decent condition from Whiskey Creek Camp to the saddle, with some brushy sections and some down trees, but the section just below the saddle dropping into Picayune Vally is a mess of down trees and the trail hard to follow; the lower section of Western States in Picayune Valley has had some trail maintenance and is in good condition. Dan McGee commented on the Shanks Cove Trail on the Trails and Maps post. I think I had reported the issues with that trail, but now can’t find it, and it certainly was not on the Trails page. A number of years ago there was a significant downfall of huge red fir trees in the gully just past the small seasonal drainage south of the Western States Trail junction. This has never been cleared, and has gotten worse by the year. As a result, the whole trail is becoming less used, and is brushy and obscure in other places. I don’t have anything to report about the south section of the trail, from Greyhorse Trail down to Five Lakes Creek Trail, but will after my next trip. Unless you are good at route finding and enjoy clambering up and down over huge trees, this is a section to avoid until the Forest Service clears the trail again. Water is still moderately plentiful at the normal spots in the backcountry, however, the lower elevations are getting really dry and the higher elevations will dry soon. By the end of the season, I’d expect only the largest and most reliable sources to be running. As always, your trip reports and trail condition comments are welcome. I no longer am able to get in early in the season and review all the trails, so I and others depend on YOU passing along information. This entry was posted in Trail Conditions and tagged maintenance, Shanks Cove Trail on 2018-07-17 Tuesday by Dan Allison. 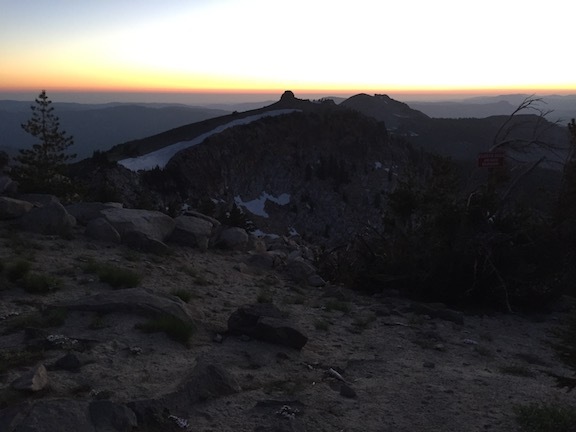 Last week I went in to the Granite Chief Wilderness at Granite Chief Trail, from Squaw Valley, and camped on top of Granite Chief (9018 feet). The wind howled all night, probably 30-40 mph, so I didn’t sleep much, but the stars were brilliant and the sunset and sunrise worthwhile. Several times in the days leading up to the trip and even on the trip, I changed my plans about where I was going to go. I headed to Whiskey Creek Camp and on towards Picayune Valley, on the Western States Trail. The trail is in general in good condition, though I did brushing of whitethorn on about 30 feet of trail that was brushed in. Whitethorn requires a sacrifice of blood, as the thorn inevitably find their way to bare skin no matter how careful I am. The section just below PIcayune saddle as the trail drops into the valley, however, is a total mess of downed trees. It took me quite a while to figure out where the trail even went. And below that it is pretty brushy for a ways. And below that, in good condition again. Some group has been doing trail work in the valley, light brushing and some tread work, and that is appreciated. I camped at my favorite Picayune Valley campsite, right beside the creek on a sandy patch, with all the sky open to stars at night. Though it clouded up and there were fewer stars than the night before. The next day I walked out to the trailhead, so see what trail conditions are. Good. Talked to several day hikers, as this trail gets more day hike use than overnight use. The wilderness boundary sign has been moved to the new location, just east of the Talbot Trailhead. These lands were purchased by the American River Conservancy and have been added to the wilderness, so there is now a mile of additional wilderness trail here. Of course the lands have been logged and it will be years before it looks like wilderness again, but this is the first step to restoration. While on the dayhike, it occurred to me that maybe now, with relatively cool weather for the summer, and no specific plans, I should hike the ADT-CA-3 section of the American Discovery Trail, which is the extension of the Western States Trail westward. So I grabbed my pack and hiked out, to Lewis Campground, from which my trip continues at https://allisondan.blog/2018/07/10/adt-ca-3-2018-07/. 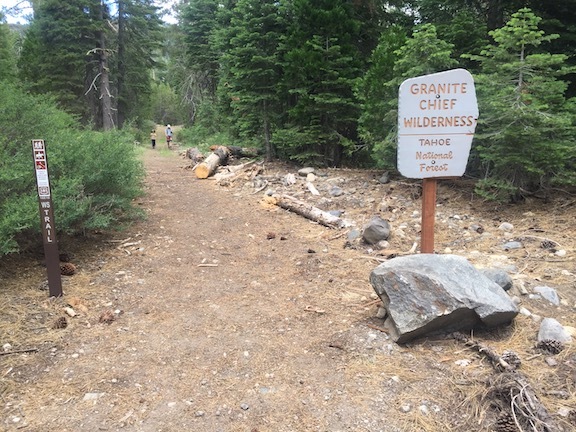 This entry was posted in Trip Reports and tagged Granite Chief, Granite Chief Trail, Picayune Valley, Western States Trail on 2018-07-10 Tuesday by Dan Allison. For my first trip of the season I mostly did trail work on the Powderhorn Trail. Working down from the top, I cleared brush, of which there is not all that much, and cleared or thinned young conifer trees, of which there is an infinite supply. The conifer trees seem nice, but if they are within four feet of the trail, and grow up, their branches always encroach on the trail. When there is dense conifer seedlings on both sides, it often essentially closes the trail. And of course as a natural process of thinning, most of these would eventually die on their own, but that leaves a tearing dead tree that is much harder to cut and remove than it was when it was alive. When it is clear that one tree is growing faster than the others, therefore quicker to reach the point where branches are above trail level, I leave that one and remove all the shorter ones around it. I completed the work from the top to the postpile meadow, about 1/3 of the 3.5 miles, and did a minor amount of work below that. There are many days of work left to go, so unless a trail crew goes in, it will be several years before the trail is in good condition again. But it is usable, if not for downed trees. There were eight down trees, six of which an be bypassed easily, and two of which hikers can clambered over or around but horses cannot pass. There is a moderate amount of winter debris, the branches that fall during the winter and can be stepped over, but when removed make a much nicer walk. On the Five Lakes Trail, there were about five downed trees, none hazardous and all easy to go around. 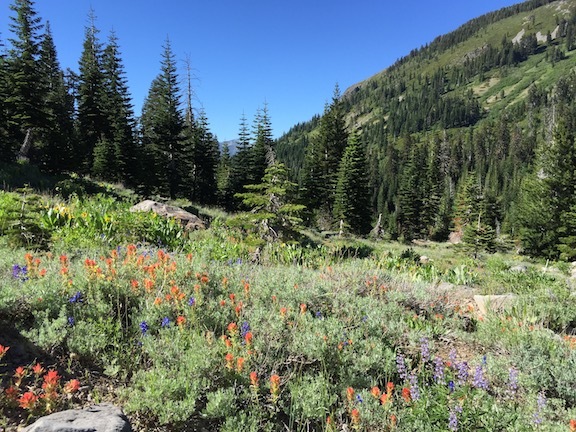 I walked in from Kaspian Campground on Hwy 89 (a nearby bus stop), up Barker Pass road and then the old jeep trail to Barker Pass (steep but quiet and beautiful), then along Forest Road 3 to Powderhorn trailhead, and in. From Diamond Crossing, the junction of the Powderhorn, Hell Hole, and Five Lakes Creek trails, I walked up Five Lakes Creek trail to Whiskey Camp and then out at Alpine Meadows trailhead and down to River Ranch on Hwy 89 (a nearby bus stop). There are patches of snow along the ridges, but most snow is gone. Many of the tributary creeks and creeklets are still flowing, but low, and will probably dry by mid-July. The flowers are moderate, in some places it is still early season and flowers have not developed, and in other places they are fading already. This entry was posted in Trip Reports and tagged brushing, Powderhorn Trail, trail maintenance on 2018-07-04 Wednesday by Dan Allison.